Make sweet arrangements easily with these vases inspired by vintage, stem-holding "frogs." 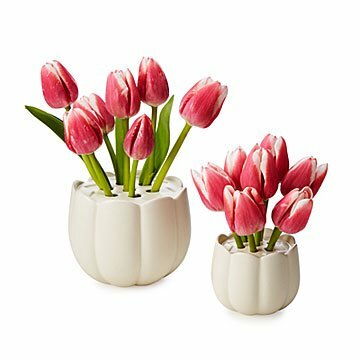 Inspired by vintage frogs (flower stem holders, not croakers), these ceramic vases help you style fresh-cut blooms through inviting design. Just fill with water, add stems to each opening, and voila—an elegant display that's anything but amateur. They're also ideal for dried decorations or pens and brushes (in the larger size). Creative gifts for moms and gardeners, they'll delight anyone who loves to bring the outside in. Made in Sri Lanka. Standard: 3" H x 2.6" Dia. ; Large: 4.5" H x 4" Dia. Add warm water and soap mix inside vase and flush to clean inside.